Dozens of men from Texas, with intellectual disabilities (guys with IQs of 60 and 70 in the words of their employer), wound up living for 30 plus years in virtual servitude in the small Iowa town of Atalissa (Muscatine County). They were there, a thousand miles from Texas, in order to provide grossly underpaid labor to a turkey processing plant in the nearby and larger Iowa town of West Liberty (a word that is mightily ironic in this instance). 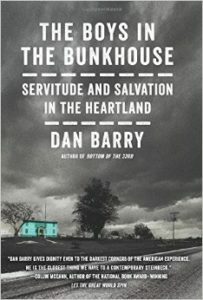 Dan Barry in The Boys in the Bunkhouse, Servitude and Salvation in the Heartland (HarperCollins, New York, NY, 2016) tells a riveting story of these men, called “boys” by nearly everyone in their hard-working lives, in his non-fiction account of rescue and resilience. His powerful and emotional narrative isn’t simply focused on allocating blame but rises to an inspiriting level by finding the light in a tale of much darkness. The labor of the men from the state schools was especially appreciated as a result of the termination of “a mostly forgotten government arrangement that allowed countless Mexicans to cross the border to work on American farms and ranches” known as the bracero program. The program had been regulated to some degree: “The Mexican guest workers could be hired only during a labor shortage; they could not be used to break strikes; and they had to be provided with decent food and housing, as well as free transportation to the border when their contracts lapsed.” But the program “more than fulfilled its great potential for abuse,” and Barry notes that the former US Department of Labor official who oversaw the program would call it “legalized slavery” explaining its termination in 1964. Henry’s Turkey Service had its employees “work turkey” in Missouri, Illinois, South Carolina and Iowa, and Barry tells the story of the 31 Henry “boys” who worked in the West Liberty, Iowa turkey processing plant and lived in the “bunkhouse” in Atalissa (whose welcoming sign on the road into the small Iowa town noted “POP. 271 & 2 GRUMPS“). As each truck pulls to a stop in the bay, some of the men . . .reach into the crate, grab the forty-pound toms by the legs, and hang them by their feet on V-shaped metal shackles that dangle along an overhead conveyor. . . they fight back with their surprisingly powerful wings. The trick is to grab a foot with one hand, swing that plump body almost behind you, grab the other foot, and hook it. The conveyor carries the shackled turkey inside the plant to be stunned in a shallow pool of electrically charged water, after which a device slits their throats to make them ‘bleed out.’ The carcasses are then immersed into a vat of scalding water, so hot that fans are needed to at least stir the humid air, and then pass through a series of mechanized rubber fingers to beat away the feathers. A worker called a ‘cutter’ removes the hocks [two hind legs], while others, called ‘pinners,’ pluck away any stubborn feathers. The birds, fat and pink, plop onto tables, and the evisceration begins. Workers called ‘rehangers’ attach the carcasses by the legs to the shackles of a second conveyor-a critical moment in the process, dictating the pace of the assembly line. A missed shackle means idle moments, lost revenue. Next in line, the ‘three-pointers.’ These workers grab the tail with one hand, the neck with the other, and put the head in the V of the shackle. Then a cutter slices a hole under the breast. Once cut, the shackled turkey moves on to the ‘drawers,’ who reach into the carcass to pull down the viscera-the heart, intestines, liver, gizzard, and spleen . . .
A worker with the evocative job title of ‘heart cutter’ grabs the heart, still attached to the viscera, and cuts away the organ and the valve stem with air scissors. The heart is then sent down a pipe to join its visceral mates in the ‘giblet cooler,’ while the valve is thrown in the ‘river,’ the water-fed trough that carries away the offal. The turkey then swings to the ‘croppers,’ who remove the bird’s feed-filled digestive system. . . There was a trick to pulling crop- or pulling guts, as it was sometimes called. [One of the boys who became an expert in this task, Henry Wilkins, explains] ‘Take this finger up there, pull the skin apart, take both your fingers up there, pull it straight down. The crop’s out and you throw it in the trough.’ (pp. 88-89). When Dan Barry saw the news reports in the spring of 2013 about the landmark $240 million judgment for 32 former employees of Henry’s Turkey Service, awarding each of them $7.5 million for emotional harm and punitive damages, he knew he had an extraordinary story to investigate and tell. (The award was the largest in the history of the Equal Employment Opportunity Commission.) No surprise then, that Boys In The Bunkhouse climaxes with a riveting retelling of the trial and the pursuit of justice by government attorney Robert Canino, who invested his body and soul in the litigation. Still, is the story truly over? Out of the corner of his eye, Barry observed “a young man sprawled on a Barcalounger and watching a Spanish-language television program at high volume (emphasis added).” This small detail caught this reader’s attention and brought to mind Eric Schlosser’s Fast Food Nation, the bestseller that was made into a film by Richard Linklater which shined a light on the exploited immigrant labor in the meat packing industry. In this reviewer’s opinion, the story is never ending and it is fair to place some responsibility on the consumer to know where their food is coming from and how it is being produced. No simple task, but there is one particular way that it can be more easily accomplished: participation as a shareholder in a community supported agriculture (CSA) farm.